Tea at Trianon: My Dad, R.I.P. 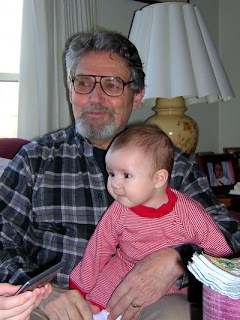 Today is the third anniversary of my father's death from cancer. In your charity, please pray for the repose of his soul. After hearing of my father's passing, I walked alone in the early morning, remembering how he loved the early morning. He was always the first one up, and loved to go jogging, or canoeing, when he was at the lake. Then he would come in, read the paper while listening to Talk radio, eating his jam and yogurt (yes, for those of you who don't know, he had bizarre eating habits.) Yes, he enjoyed Talk radio. He is the only person I know of who could listen to the radio, watch TV, and play the violin at the same time. And when he watched TV, he never watched just one program, but would watch five at the same time, switching from one to another, keeping track of what was going on on each show. He was one of the most well-informed men I ever met, even though I never saw him sitting down to read anything; he read while he was shaving and performing his morning toilette. He could discuss any number of topics, be it history, politics, science, with familiarity. Whenever we traveled, he would point out all the geological and historical points of interest, so that ever after, when driving on 81, I still hear his voice discussing glaciers and rock formations. He HATED to stop when traveling, except for a brief meal and bathroom break, but liked to get to where he was going. (On the way to Canada his favorite place to stop was Clark's Summit,PA.) He did let up a bit in his old age. His great interest, after family history, was music. He was a musician and worked at it his entire life. He was an Irish tenor, and played the violin and mandolin. When we were small , on moonlit nights, he would stand on the back porch and play Irish songs on the mandolin, while my sister and I would dance. He loved directing the church choir; he loved making music with his brothers at family reunions. He worked all his adult life as a civil engineer, and for many years worked two jobs, a day job as County engineer in Jefferson Co, WV, and then ran his own business at night and weekends. It never occurred to him that he would not work twelve hours a day (at least) to provide for his family. He was the most devoted of family men, and loved corresponding with all his brothers, sister, nieces, nephews, first and second cousins. He loved the outdoors, camping, hiking, canoeing; every year he looked forward to the Family Reunion. He enjoyed maintaining ancient Celtic traditions, such as the midsummer bonfire on St. John's Eve ( June 23.) He wore his kilt with the clan tartan at our weddings, and startled the locals by playing the bagpipes. He loved being the chieftain of the Clan. He had a VERY quirky sense of humor, which we all got used to eventually. I could go on and on, but must stop. Let me end by saying that he taught me to say the "Our Father" and "Hail Mary." He loved the Scriptures, and passed that love on to me. He was truly a gentle-man; one would never have guessed that his life would be cut short by such hideous suffering, but we leave that to God. His courtesy and lack of complaining during such excruciating indignities touched all hearts. He drifted peacefully into Eternity after many rosaries, his loved ones nearby, holding the hand of his little Andi. What a lovely tribute to your father. He sounds like a fascinating man who was a great deal of fun to be around. I lost my father in 2001, and he shared many traits with your dad (played in a bagpipe band, millions of projects going on, always physically vital and active). May their blessed souls rest in peace. Thanks, Lylia. Your dad sounds exactly like mine. He was a lot of fun, and could make the most innocuous statement sound hilarious. I see a tamed wildness in his eyes, but tamed only for love, and only temporarily. I'll look forward to meeting him someday. Indeed, a prayer or two for the man today. "Tamed wildness." Yes, that describes him, and some other people in the family. Thank you, Carol. Memory Eternal! May he rest in peace where all the blessed Saints repose. Thank you, Juliana. Thank you, Jeff. What an admirable man, my prayers for all of you...thanks for offering his example for us. One can glimpse the unique family you come from by the way you write and your own beliefs. The greatest gift a parent can give is to teach their children to live their lives, with joy, honour, integrity, exuberance and piety. Your father taught you well Elena. I will say a prayer for his soul and to thank him for his input into making you such an example for us all. Thank you for your prayers, Terry. Yes, marie, we are a pretty unique bunch. Such a beautiful post about your dad. I am so sorry for your loss. I pray that his soul through the mercy of God, rest in eternal peace, amen.